It is often the unexpected occurrences that make having an interest in the natural world so rewarding. I went out on the Wiltshire Downs this weekend ostensibly to photograph the landscape. Building up to the weekend the weather had been perfect - the air had been crystal clear and the skies an almost Mediterranean azure blue. However, when I had the opportunity to head out, the perfect conditions had been replaced with a not-so-perfect thin blue sky and a smog-like haze. Not to be deterred, I shouldered my camera gear and struck out for the Downs, prepared for the 3 mile trek to my destination. In practice, I travelled less than a hundred meters from the car before getting distracted. 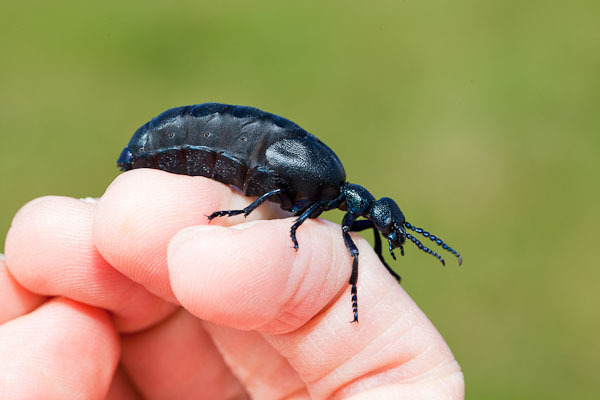 The reason; in a bank, clambering through the grass was a creature I hadn’t seen for at least 10 years - a large Black Oil Beetle. Doubtless spurred into action by the unseasonably warm (almost hot!) temperatures and dry conditions I found not one but more than 40 of these intriguing insects itinerantly rambling through the spiky downland grass. Quite what the purpose of their incessant wandering was I can’t say - they seemed to ignore other beetles when they encountered one another and just kept walking (sometimes going backwards and forwards over the same patch of ground). Oil beetles exhibit pronounced sexual dimorphism and females with their distended abdomens are about twice the size of males. And they are remarkable creatures both in appearance and lifestyle. I’m not squeamish about picking insects up, but when you see an unfamiliar creature this peculiar looking and of this size you think twice about handling it. However, my curiosity quickly got the better of me and you’ll be glad to hear they don’t bite! In fact, they are very gentle and seemed to appreciate the warmth of my skin. 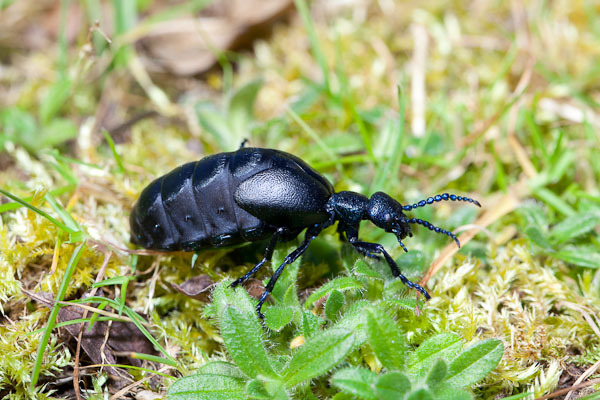 The name oil beetle derives from the fact that when under duress they can exude a caustic, oil-like substance from their joints. They tend to favour heathlands and coastal grassland environments - often areas with sandy soil (which perhaps goes some way to explaining why I’ve so rarely seen them around Wiltshire). The adults are strictly vegetarian but the rest of their lifestyle is nothing if not intriguing. 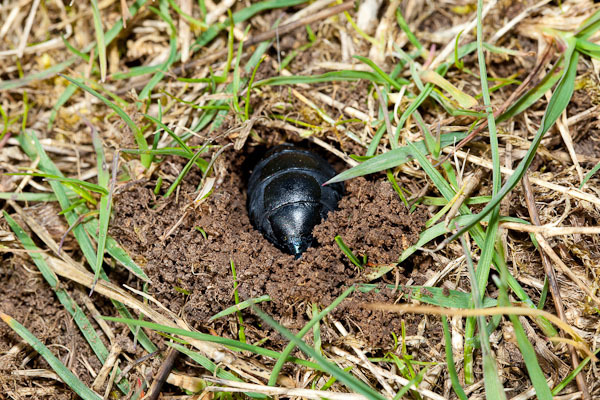 Females will dig a burrow close to solitary bee colonies into which they deposit eggs which hatch in the spring of the following year. When they initially hatch they look like small, louse like critters called triungulins (they have 3 claws on each foot - hence the name). These small beasties immediately climb up the nearest flower head where they wait for a bee to visit. If a triungulin is in luck it will latch onto the bee and hitch a ride back to its nesting site where it drops off. Once inside the bee’s nest site the small larva then sets about devouring the bee’s eggs, larvae and pollen supplies. It also changes form - into a maggoty grub. Eventually, when fully grown, the larva will metamorphose once again into an adult beetle. It is a bizarre and fascinating life history. 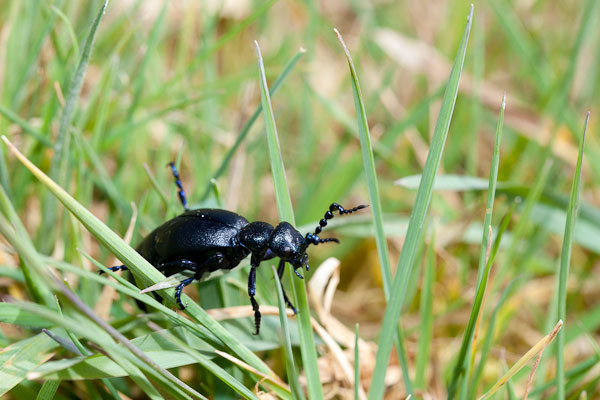 Yet, whether due to the scarcity of bees generally in recent times or other factors, such as habitat loss, it does appear that oil beetles are declining rapidly. There used to be 8 species in the British Isles, but only four now remain and they seem to be struggling.